It is always best to avoid problems in the first place through preventative measures. This website provides all the information you need to prevent your tree from suffering from disease, however not everything can be prevented. More bonsai are killed by improper watering than by all other causes combined. Bonsai soil should allow for water to drain freely but still allow for some moisture retention. If you over water your bonsai may suffer from a condition known as Root Rot which is often fatal. 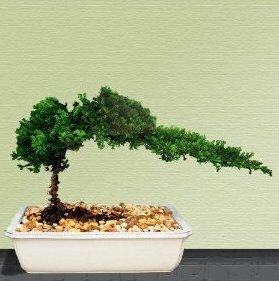 Under watering is also a common problem, because although it may seem that watering every day or every second day should be enough, you must consider the fact that bonsai containers are small and shall which makes it easy for retained moisture to evaporate. Check daily or even a few times daily (depending on location) for moisture and water as necessary. See our Watering page for proper watering techniques. Besides the fact that deciduous trees will naturally lose their leaves in the fall and regain them in the spring, sometimes bonsai loose leaves or become discolored for various reasons. Leaves are most likely to fall off after repotting if too many roots have been cut off and the tree is no longer able to support the leaves it had. Remember to keep the root mass proportionate to the leaf mass to avoid this problem, and never cut off more than 1/3rd of the tree’s roots. Another reason could be due too much sunlight. If you do not protect your bonsai with a shade screen or put it in partial shade, some leaves may become scorched by the sun. Unfortunately you cannot save these leaves, but don’t pull them off. Keeping them on protects the tree from damage to the layer of leaves underneath. Simply cover the tree or move it to avoid sun scorch. Another reason for leaf loss or discoloration could be lack or overdose of fertilizer and/or water (see our page on Fertilizing). If none of these seem to be the case, look carefully at your tree and see if it is diseased or infested by some pests. A bonsai is nothing more than a miniature version of a normal plant, therefore it can be treated with commonly found insecticides and fungicides according to directions on the package. Although most bonsai species are very hardy, some are still susceptible to disease and pests. Insects such as aphids, spider mites, scale, and root aphids are a common problem which can easily be corrected by sprays or soapy rinses. To maintain a healthy tree, it is a good idea to spray the entire tree with a systemic insecticide once a month throughout spring and summer. Every month, we get multiple emails from distraught viewers of our website about dying or dead bonsai trees and about 85% of these trees are commercial bonsai trees that had rocks glued on top of the soil. This is not a coincidence; these trees are destined to die within a couple of months, so please read on if you just purchased one of these or are considering to buying one. Question: Should I buy a commercial bonsai tree with rocks glued on top of the soil? Most plants, especially bonsai, do not like soggy soil, hence why bonsai pots have large drainage holes on the bottom and good draining soil is required (see our pages on Pots and Trays, Soils, and Potting). When a bonsai’s roots are exposed to too much water, the roots will rot and/or a fungus will grow. This is usually deadly and the tree cannot be saved (see Common Problems). The number one killer of bonsai trees is root rot because of over watering. When you have glued on gravel on top of the soil, the moisture is locked in, oxygen exchange is inhibited, fungus grows, the roots rot, and the tree dies. The glue that comes with these commercial bonsai is water based and is supposed to dissolve with time, but the problem is that it takes too long to dissolve and the bonsai is usually dead by then. Elm (outdoor bonsai) suffering from too much moisture, because it was kept indoors. Plant suffering from scale. Scale and mites can be killed by spraying the plant with isopropyl alcohol. You can remove the dead bugs with a damp towel. This is not a bonsai! This is a twig in a pot with a random Asian figurine! Also, please note the glued on rocks. Here is another example of the glued on rocks.